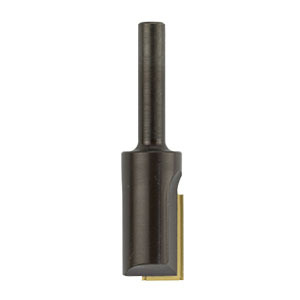 These single flute replaceable tip straight cutters offer excellent value for high volume production work and, because of their design, are suitable for use in all types of machine including hand routers, fixed head & CNC machines. NB Each cutter is supplied with one double sided blade. The VERSOFIX reversible Tungsten Carbide inserts are treated with a special coating, which gives each cutting edge a hardness several times that of normal tungsten carbide, making it particularly suitable for cutting laminated worktops etc. The inserts have a ground-in chip breaker to provide the optimum cutting angle, ensuring good chip formation even in the smallest diameters, giving a lighter cut and increased durability of the tool. The specially designed fixing of the insert in a safety groove ensures easy and speedy turnover or replacement without the need for precise setting. The unique features of this cutter ensure problem free routing, plunging and boring even to considerable depth in solid timber and man made boards. 1. Optimum cutting angle of 15° achieved through ground-in chip breaker giving good chip formation which gives lighter cuts and longer tool life. 2. Specially designed secure fixing of insert with grub screws locating in a safety groove. 3. Better and smoother chip space avoiding blockages, giving a good chip clearance even with high chipping volume. 4. 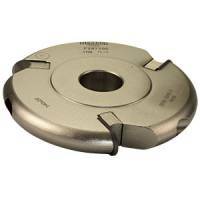 Specially designed cutter end ensures perfect boring even in extra thick board. (For through holes use chamfered inserts). 5. 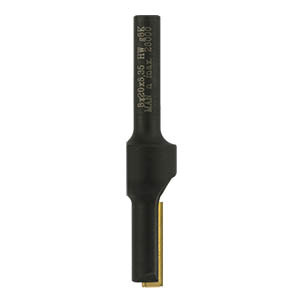 Chip thickness limited and kick-back free, therefore suitable for use in hand routers. 6. Symmetrical design ensures the tool is perfectly balanced. 7. Length stop location to ensure precise fixing of insert with correct bottom cut. 8. Hardened tool body for heavy work load in continuous use. Teflon coating prevents undue heating and chip adherence, also achieves improved chip clearance due to the smoother surface.